David is a member of The British Association of Aesthetic Plastic Surgeons (BAAPS), The British Association of Plastic Reconstructive and Aesthetic Surgeons (BAPRAS) (formerly BAPS) the Plastic Surgeon section of The Royal Society of Medicine (RSM), the International Association of Plastic Surgeons (ISAPS) and is on the Specialist Register of the General Medical Council (GMC) as a Consultant Plastic Surgeon. He has also held office positions as President and Secretary of the Windsor Medical Society, Secretary of the plastic surgery section of the Royal Society of Medicine, Secretary of the Face, Head and Neck Interest Group in Plastic Surgery and as an Assessor for The Royal College of Surgeons of England. David qualified from Leeds University Medical School in 1984 MBCHB with a distinction in surgery and the McGill prize for best performing student in surgery. His passion for plastic surgery emerged whilst at the Mayo Clinic in Rochester, Minnesota, USA marking the beginning of his career in plastic surgery. Returning to England, he trained for five years in surgical rotation at St James’s University Hospital, Leeds. His training enabled him to work with many of the leading plastic and cosmetic surgeons in the Greater London area and in Canniesburn Hospital, Glasgow. Appointed as Consultant Plastic Surgeon at The Glasgow Royal Infirmary Hospitals in 1995, David later took up a new appointment as Consultant Plastic Surgeon at Wexham Park Hospital and King Edward VII Hospital, Windsor, taking over from his mentor in cosmetic surgery, Mr Magdy Saad, who retired from the NHS. Working for the NHS as a Consultant Plastic Surgeon for over 10 years, David led the cleft lip and palate team regularly carrying out neonatal cleft lip repairs until the service recently consolidated. 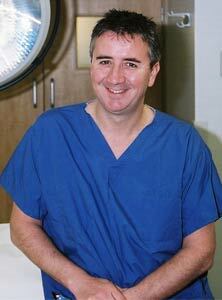 He has an interest in breast reconstruction and is particularly renowned for using micro-surgical methods for this. Since 2006, David has devoted all of his time and energies to his thriving private cosmetic and plastic surgery practice. He has worked in the spirit and tradition of his mentor Mr Magdy Saad continuing his successful cosmetic surgery practice for over twenty years. Patients are regularly referred from all over the UK, Europe and overseas including the Middle East and USA. David attends international meetings to keep in the forefront of cosmetic surgery and he has made presentations at both international and national meetings. He is married to Jackie Crawford, who is a Dermatologist and has four children. Outside work he enjoys family life, skiing, sailing, trail running and cycling. He is a devoted season ticket holder and fan of the London Wasps Rugby Team.